…Today is the founding day, and all the aristocrats will gather at the Royal Castle for a party held by the royal family. As the head of an Earl’s House, I’ve also been invited to this party. Every single person who entered the venue were dressed beautifully, following the dress code of an official function. Of course, I, as well, was dressed in clothing I had specially tailored for this occasion. Suddenly, the hall became noisy. …It seems that Edward-sama, Yuri-sama, and the son of the Pope of the Darryl church, Van-sama, has arrived. Edward-sama came dressed in a splendidly deep green suit. Next to him… Yuri-sama, who entered the hall with her hand linked with Edward-sama, is wearing a pink dress. With flowers sewed on the upper portion of her dress here and there, it splendidly enhances her youthfulness. Her skirt puffs up like a pannier skirt, with a slit on the side. There were also white lace and something pale pink underneath it, and one could catch a glimpse of them whenever she moves. Van-sama on the other hand, as someone part of the Darryl church, was wearing Darryl church’s formal dress. When they appeared, the people in the hall went to them in order to greet them one after another. Because a member of the royal family showed up, it was only natural. …However, there were also people who just watched them from afar. Their actions are acceptable due to the present unstable situation. For the time being, I did not go to greet him either, but if he comes near me, I’ll greet him then. Even so… Edward-sama didn’t come here as a sponsor but as an attendant. Surely, even though he has yet to ascend the throne, he has been pressured to do so by Ellia-sama and her House. Well, since the person in question is conversing with Yuri-sama normally, he might not mind it at all. While I was thinking that, the surrounding became as rowdy as the time Edward-sama made his appearance. The people who arrived is the Duke of Armelia and the Prime Minister, Louis-sama, and his wife, Mellice-sama. As usual, Mellice-sama looks beautiful. Today, she was dressed in the height of fashion, matching her light blue eyes… a dark blue gown. Really, as expected of someone who was given the title of “The Flower of Society,” she is beautiful. Regardless if it was a man or a woman, they went to greet the couple. The two of them were most likely already used to it and tactfully returned the greetings. Soon after, the surrounding of the entrance of the hall became even more rowdy. I, as well, directed my line of sight away from the Duke and Duchess. At that place, was the Duke’s son, Berne Tash Armelia, and the girl he was escorting. That girl attracted the eyes of all the people in the hall. Similarly, I was also one of the people who was admiring her. …Beautiful. That word occupied my entire head. She had silver glossy hair that seems to shine even more under the light. She has well sculpted facial features, and skin as white as porcelain. With deep blue eyes, similar to the finest sapphire. And the dress she was wearing was glossy in addition to having some kind of luster… I wonder what kind of cloth it’s made out of. At the very least, I have never seen such fabric before. And that thin beige dress tailored from that kind of fabric, is a dress completely of a different style from all the dresses found in this place. First of all, the dress has no puffy sleeves, and rather than being in a form of an hourglass, it is shaped with like a curved line similar to the letter “S”… In addition, rather than having a skirt with volume, it has a refreshing looking narrow skirt. With her slender figure, the dress suited her really well. And the skirt was finished with an elaborate embroidery done with blue and silver thread. And to polish her look, she had a deep blue sash, similar to the color of her eyes. She seems to illuminate under the lights, and with her delicate frame… she looked like the Goddess of the Moon. Holding that sort of impression, I couldn’t separate my eyes from her. …Exactly who in the world is that girl? Such a beautiful woman, I would never forget her after seeing her once. While bathing in the eyes of the people in the hall, she walked deep into the hall. And then, she stopped right in front of the Duke and Duchess of Armelia and started a conversation. 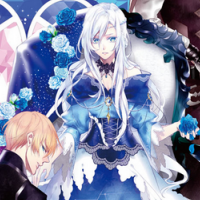 Impossible, is she really Iris Lana Armelia-sama, the daughter of Duke Armelia? No, the difference in appearance is too excessive… In addition, after her engagement with Edward-sama was annulled, she should not be able to attend any parties. If that’s so, then…? While I was thinking of that question inside my head, another door opened. The person who arrived was the Queen Dowager… Queen Dowager? Not the King but the Queen Dowager…? But at the time when the organizer made an appearance, I suddenly remembered something. Before the King rose to the throne, she was once the Queen who dominated this Kingdom. This was because when her elder brother, the Crown Prince, died, she became the only direct descendant of the royal family. However, because it was unprecedented for a woman to take the throne, she married a Duke and had him assume the role of the King. During that era, rather than the King, it was the Queen who appeared time and time again and acted as the organizer. Therefore, I feel nostalgic looking at the current spectacle. When the previous King, her husband, passed away and her son, the present King, rose to the throne, and she quickly backed away. And when the King married and the Earl’s daughter, the Queen then became the Queen Dowager and retired to the Queen Dowager’s palace. Since then, she hasn’t been participating much in these kinds of events… Really, I wonder if something happened. Naturally, there were others who remembered the past and lowered their heads. I was also one of those people. She accepted our greetings with a smile and sat at the seat reserved for the royal family. At the same time, the music started playing and the party began. For some reason, the Queen Dowager was looking at the mystery woman Berne-sama brought, who was currently engrossed in a conversation. Suddenly, the mysterious woman began to move. Apparently, she was called by the Queen Dowager. When she was in the vicinity of where the Queen Dowager was sitting, all of us had already forgotten our own conversations and perked our ears to listen to theirs. To think that it was the Queen Dowager who had personally invited her, we couldn’t hide our surprise. When the Queen Dowager said those words, all of us received an even greater blow. She was the person who is operating “that” Azura Conglomerate? In addition, she was managing the fief as the fief Lord’s proxy! Speaking of Azura Conglomerate, it is a popular conglomerate in the Kingdom, large enough to fight over the first or second spot. Although it has only been recently established, not even three years old… nevertheless, with conglomerate’s excellent management and unprecedented product line-up, they quickly gained attention. Their chocolate products is a great favorite of mine, and my family is using their beauty products. With beautiful movements, she expressed her gratitude and withdrew. Although only three to four sentences were said during the conversation, because the organizer must talk with various other people, this was only natural. When she withdrew, the next person was called. She once again returned to being a wallflower. The person probably wanted to remain inconspicuous… however, everyone was glancing at her. With just that exchange alone, everyone was aware that her value had become immeasurable. First of all, her appeal of being the President of Azura Conglomerate. With ample funds and assets, she is an existence that can’t be ignored. However, above all… she has the support of the Queen Dowager. She was summoned by the noblest of all nobles in the Kingdom, and she was asked to consult with the Queen Dowager about any matter. The royal family… to receive the backing of the person with the most influence in a place like this is an honor. Now that it has come to this, why did Edward-sama annulled his engagement with her… After all, with her beautiful appearance, talent, lineage, and backing… No matter how one looks at it, she’s attractive. Or rather, if he really wants to ascend the throne, she is someone he would want to draw in. To actually ignore the lady, annulled his engagement with her, and immediately get engaged to another girl, if anything, it was too malicious. At the very least, the neutral people will sneer in secret while the First Prince faction will probably gloat about this. And the people in the Second Prince’s faction, after having let go of such a big fish, I guess they would probably end up gritting their teeth. Right now, everyone wants to get acquainted with her and were looking for the perfect timing to do so. However, she is always in a conversation with one of her family members, and because of that, it’s hard to find the right timing. While the others were thinking of strategies, a girl who couldn’t read the atmosphere made such remarks. Can you guys guess who’s the girl who can’t read the atmosphere?